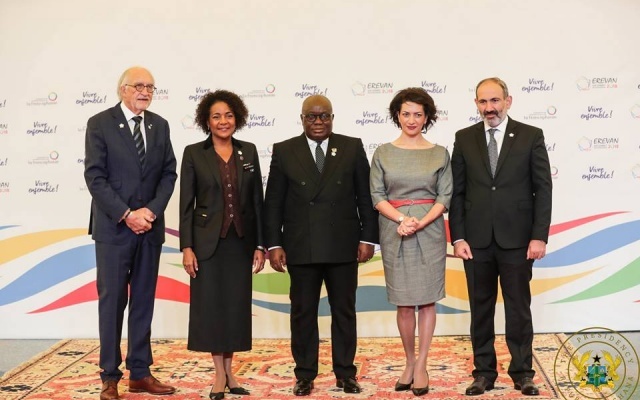 President Nana Addo Dankwa Akufo-Addo says the lives of Ghanaians are intimately linked with the francophone world, and Ghana’s membership of La Francophonie should serve as a big boost to addressing some of the country’s mutual concerns. With French set to become one of the world’s most commonly spoken languages, and with French speakers rising to over 700 million, of which 80% will be in Africa, President Akufo-Addo noted that the lives of Ghanaians, therefore, are intimately linked with the Francophone world. “As a country bordered to the north, east and west by French-speaking countries, and to the south by the Gulf of Guinea, Ghana recognises the strategic importance of her immediate neighbours, to whom we are bound by profound ties of blood, geography, and history, and, indeed, of all French-speaking countries, to the development of our country,” he said. 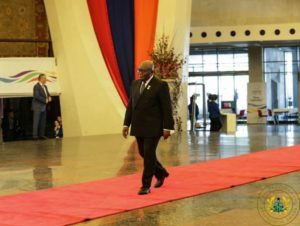 President Akufo-Addo made this known on Friday, 12th October 2018, when he delivered a speech at the 17th La Francophonie Summit, being held in Erevan, Armenia. Addressing the Summit in French, the President noted that during his time as Minister for Foreign Affairs in the government of His Excellency John Agyekum Kufuor, he was privileged, on 28th September, 2006, to lead the Ghanaian delegation to the 11th Francophonie Summit in Bucharest, which resulted in Ghana becoming an Associate Member of La Francophonie, without first having to be made an Observer Member. 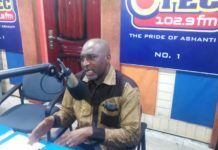 “Ghana, an Anglophone nation, is only one of a handful of countries that enjoy membership of both the Commonwealth and La Francophonie, and we value this situation very much,” he said. 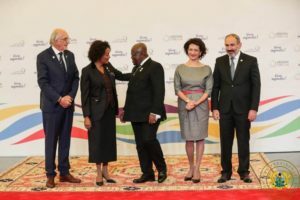 Ghana, a strong, functioning democracy, the President stressed, shares the aims and values of La Francophonie, adding that Ghana looks forward to playing a significant role in the realization of these values. 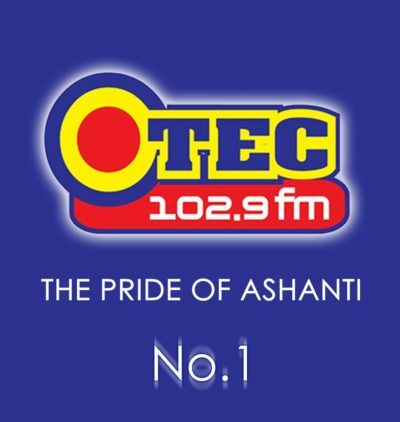 “Our goal is to live, one day, in a bilingual Ghana, i.e. English and French, together with our own indigenous languages. We have already begun to work towards this. On 15th May 2018, I authorized the signature of a language pact with La Francophonie, towards helping to make this a reality,” he said. Additionally, President Akufo-Addo indicated that his government has introduced a bilingual classroom project at the basic education level, where certain subjects are taught in both English and French, and the study of French is being made compulsory at the basic level of Ghana’s educational system. 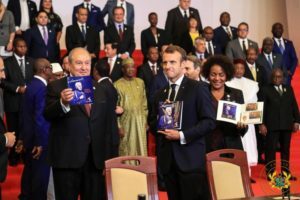 With 84 members making up La Francophonie, the President noted that an increase in trade and investment co-operation amongst member countries should be deeply promoted and encouraged. 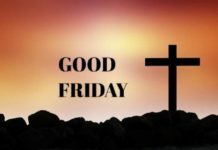 “History tells us that this is the best route to general progress and prosperity. 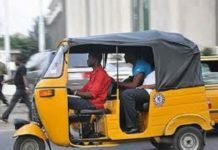 With the help of digital technology, we can then accelerate economic growth, create the much-needed jobs for our youth, and take advantage of the vast potential of Africa’s young population,” he added. 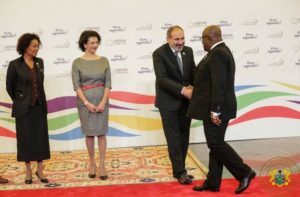 The 21st century, with the aid of science and technology, President Akufo-Addo said, offers humankind, despite the greed of a few, the prospects, for the first time in human history, of building a world civilisation of prosperity in freedom for all the peoples of the world, where all citizens live in dignity and security. “I am an unrepentant optimist, and I am confident that we can work together to build such a new world, with member states of La Francophonie taking the lead,” the President said.